American test pilot astronaut 1962-2004. Only astronaut to fly Gemini, Apollo, and Shuttle. Ninth person to walk on the moon. Space speed record (11,107 m/s). Flew in space six times. Status: Inactive; Active 1962-2004. Born: 1930-09-24. Died: 2018-01-05. Spaceflights: 6 . Total time in space: 34.82 days. Birth Place: San Francisco, California. Young was a legendary astronaut, and head of the astronaut corps for two decades. Young retained his Florida accent and idioms ("them boys") throughout his life. In February 1996 Young was assigned as Associate Director (Technical), responsible for technical, operational and safety oversight of all Agency Programs and activities assigned to the Johnson Space Center. On December 31, 2004 Young retired from NASA. He continues to advocate the development of the technologies that will allow us to live and work on the Moon and Mars. Those technologies over the long (or short) haul will save civilization on Earth. Born September 24, 1930, in San Francisco, California. Married to the former Susy Feldman of St. Louis, Missouri. Two children. Two grandchildren. Enjoys wind surfing, bicycling, reading, and gardening. Graduated from Orlando High School, Orlando, Florida; received a bachelor of science degree in aeronautical engineering with highest honors from Georgia Institute of Technology in 1952. Fellow of the American Astronautical Society (AAS), the Society of Experimental Test Pilots (SETP), and the American Institute of Aeronautics and Astronautics (AIAA). Awarded the Congressional Space Medal of Honor (1981), 3 NASA Distinguished Service Medals, NASA Outstanding Leadership Medal (1992), NASA Exceptional Engineering Achievement Medal (1987), NASA Outstanding Achievement Medal (1994), Navy Astronaut Wings (1965), 2 Navy Distinguished Service Medals, 3 Navy Distinguished Flying Crosses, the Georgia Tech Distinguished Young Alumni Award (1965), Distinguished Service Alumni Award (1972), the Exceptional Engineering Achievement Award (1985), the Academy of Distinguished Engineering Alumni (1994), and the American Astronautical Society Space Flight Award (1993). Inducted into the National Aviation Hall of Fame in 1988. Recipient of more than 75 other major awards, including 4 honorary doctorate degrees. Upon graduation from Georgia Tech, Young entered the United States Navy. After serving on the west coast destroyer USS LAWS (DD-558) for 1 year, he was sent to flight training. He was then assigned to Fighter Squadron 103 for 4 years, flying Cougars and Crusaders. After test pilot training at the U.S. Navy Test Pilot School in 1959, he was assigned to the Naval Air Test Center for 3 years. His test projects included evaluations of the Crusader and Phantom fighter weapons systems. In 1962, he set world time-to-climb records to 3,000-meter and 25,000-meter altitudes in the Phantom. Prior to reporting to NASA, he was maintenance officer of Phantom Fighter Squadron 143. Young retired from the Navy as a Captain in September 1976, after completing almost 25 years of active military service. 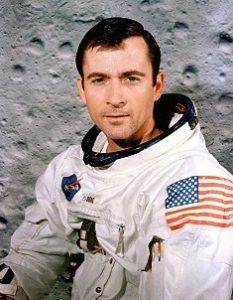 In September 1962, Young was selected as an astronaut. He is the first person to fly in space six times from earth, and seven times counting his lunar liftoff. The first flight was with Gus Grissom in Gemini 3, the first manned Gemini mission, on March 23, 1965. This was a complete end-to-end test of the Gemini spacecraft, during which Gus accomplished the first manual change of orbit altitude and plane and the first lifting reentry, and Young operated the first computer on a manned spacecraft. On Gemini 10, July 18-21, 1966, Young, as Commander, and Mike Collins, as Pilot, completed a dual rendezvous with two separate Agena target vehicles. Mike Collins also did an extravehicular transfer to retrieve a micro meteorite detector from the second Agena. On his third flight, May 18-26, 1969, Young was Command Module Pilot of Apollo 10. Tom Stafford and Gene Cernan were also on this mission which orbited the Moon, completed a lunar rendezvous, and tracked proposed lunar landing sites. His fourth space flight, Apollo 16, April 16-27, 1972, was a lunar exploration mission, with Young as Spacecraft Commander, and Ken Mattingly and Charlie Duke. Young and Duke set up scientific equipment and explored the lunar highlands at Descartes. They collected almost 200 pounds of rocks and drove over 16 miles in the lunar rover on three separate geology traverses. Young's fifth flight was as Spacecraft Commander of STS-1, the first flight of the Space Shuttle, April 12-14, 1981, with Bob Crippen as Pilot. The 54-1/2 hour, 36-orbit mission verified Space Shuttle systems performance during launch, on orbit, and entry. Tests of the Orbiter Columbia included evaluation of mechanical systems including the payload bay doors, the attitude and maneuvering rocket thrusters, guidance and navigation systems, and Orbiter/crew compatibility. One hundred and thirty three of the mission's flight test objectives were accomplished. The Orbiter Columbia was the first manned spaceship tested during ascent and entry orbit without benefit of previous unmanned missions. Columbia was also the first winged reentry vehicle to return from space to a runway landing. It weighed about 98 tons as Young landed it on the dry lakebed at Edwards Air Force Base, California. Young's sixth flight was as Spacecraft Commander of STS-9, the first Spacelab mission, November 28-December 8, 1983, with Pilot Brewster Shaw, Mission Specialists Bob Parker and Owen Garriott, and Payload Specialists Byron Lichtenberg of the USA and Ulf Merbold of West Germany. The mission successfully completed all 94 of its flight test objectives. For 10 days the 6-man crew worked 12-hour shifts around-the-clock, performing more than 70 experiments in the fields of atmospheric physics, Earth observations, space plasma physics, astronomy and solar physics, materials processing and life sciences. The mission returned more scientific and technical data than all the previous Apollo and Skylab missions put together. The Spacelab was brought back for re-use, so that Columbia weighed about 110 tons as Young landed the spaceship at Edwards Air Force Base, California. Young was also on five backup space flight crews: backup pilot in Gemini 6, backup command pilot of the second Apollo mission (before the Apollo Program fire) and of Apollo 7, and backup spacecraft commander for Apollo 13 and 17. In preparation for prime and backup crew positions on ten space flights, Young has put more than 15,000 hours into training so far, mostly in simulators and simulations. He has also logged more than 13,250 hours flying time in props, jets, helicopters, rocket jets, and spacecraft, including 835 hours in six space flights. In January 1973, Young was made Chief of the Space Shuttle Branch of the Astronaut Office, providing operational and engineering astronaut support for the design and development of the Space Shuttle. In January 1974, he was selected to be Chief of the Astronaut Office, with responsibility for the coordination, scheduling, and control of activities of the astronauts. Young served as Chief of the Astronaut Office until May 1987. During his tenure, astronaut flight crews participated in the Apollo-Soyuz joint American-Russian docking mission, the Space Shuttle Orbiter Approach and Landing Test Program, and 25 Space Shuttle missions. From May 1987 to February 1996, Young served as Special Assistant to the Director of JSC for Engineering, Operations, and Safety. In that position, he had direct access to the Center Director and other senior managers in defining and resolving issues affecting the continued safe operation of the Space Shuttle. Additionally, he assisted the Center Director in providing advice and counsel on engineering, operational, and safety matters related to the Space Station, Shuttle upgrades, and advanced human Space Exploration Programs. Young was then assigned as Special Assistant to the Director of JSC for Engineering, Operations, and Safety. In this position he had direct access to the Center Director and other senior managers in defining and resolving issues affecting the continued safe operation of the Space Shuttle. Additionally, Young also assisted the Center Director in providing advice and counsel on engineering, operational and safety matters related to the Space Station, Shuttle upgrades, and advanced human Space Exploration Programs such as Lunar Bases and Mars Exploration. In February 1996 Young was assigned as Associate Director (Technical). He is responsible for technical, operational and safety oversight of all Agency Programs and activities assigned to the Johnson Space Center. As an active astronaut, Young remained eligible to command future Shuttle astronaut crews but did not fly again before retiring from NASA in 2004. Departed Date: 2004-12-31. Total EVA Time: 0.84 days. Number of EVAs: 4. Marital Status: Married. Children: Two children. Education: GIT;Patuxent. Family: Astronaut. Country: USA. Spacecraft: Gemini. Flights: Gemini 3, Gemini 6, Gemini 10, Apollo 207, Apollo 7, Apollo 10, Apollo 13, Apollo 16, Apollo 17, STS-1, STS-9, STS-61-J. Projects: Apollo, STS. Agency: USN. Bibliography: 12, 4457, 6242. 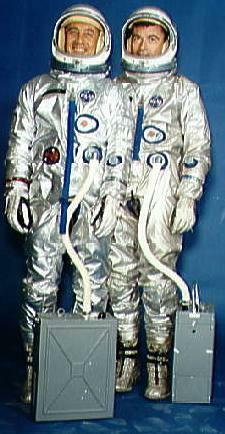 Grissom and Young in their G3C suits for Gemini 3. This was the only flight the suits were used on. 1930 September 24 - . Birth of John Watts Young - . Nation: USA. Related Persons: Young. American test pilot astronaut 1962-2004. Only astronaut to fly Gemini, Apollo, and Shuttle. Ninth person to walk on the moon. Space speed record (11,107 m/s). Flew in space six times. 6 spaceflights, 34.8 days in space. Flew to orbit on Gemini 3 (1965), Gemini 10, Apollo 10, Apollo 16, STS-1, STS-9. 1963 October 21 - . The second prototype space suit was received by MSC's Crew Systems Division - . Nation: USA. Related Persons: Young. Program: Apollo. Spacecraft: A7L, Apollo CSM, CSM Hatch. The second prototype space suit was received by MSC's Crew Systems Division. Preliminary tests showed little improvement in mobility over the first suit. On October 24-25, a space suit mobility demonstration was held at North American. The results showed that the suit had less shoulder mobility than the earlier version, but more lower limb mobility. 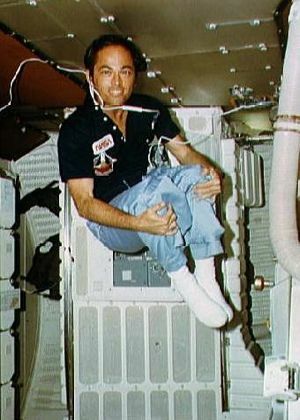 Astronaut John W. Young, wearing the pressurized suit and a mockup portable life support system (PLSS), attempted an egress through the CM hatch but encountered considerable difficulty. At the same time, tests of the suit-couch- restraint system interfaces and control display layout were begun at the Navy's Aviation Medical Acceleration Laboratory centrifuge in Johnsville, Pa. Major problems were restriction of downward vision by the helmet, extension of the suit elbow arm beyond the couch, and awkward reach patterns to the lower part of the control panel. On October 30-November 1, lunar task studies with the suit were carried out at Wright-Patterson Air Force Base in a KC-135 aircraft at simulated lunar gravity. Mobility tests were made with the suit pressurized and a PLSS attached. Grissom and Young prime crew for the first manned Gemini flight. - . Nation: USA. Related Persons: Grissom, Young. Flight: Gemini 3. Spacecraft: Gemini. Director Robert R. Gilruth, Manned Spacecraft Center, announced Astronauts Virgil I. Grissom and John W. Young as the prime crew for the first manned Gemini flight. Astronauts Walter M. Schirra, Jr., and Thomas P. Stafford would be the backup crew. .
1965 February 21 - . LV Family: Titan. Launch Vehicle: Titan II. 1965 March 23 - . 14:24 GMT - . Launch Site: Cape Canaveral. Launch Complex: Cape Canaveral LC19. LV Family: Titan. Launch Vehicle: Titan II GLV. Gemini 3 - . Call Sign: Molly Brown (from Broadway play 'The Unsinkable..'. Crew: Grissom, Young. Backup Crew: Schirra, Stafford. Payload: Gemini SC3. Mass: 3,225 kg (7,109 lb). Nation: USA. Agency: NASA Houston. Class: Manned. Type: Manned spacecraft. Flight: Gemini 3. Spacecraft: Gemini. Duration: 0.20 days. Decay Date: 1965-03-23 . USAF Sat Cat: 1301 . COSPAR: 1965-024A. Apogee: 240 km (140 mi). Perigee: 160 km (90 mi). Inclination: 33.00 deg. Period: 88.40 min. First manned test flight of Gemini. Virgil I. Grissom and John W. Young entered an elliptical orbit about the earth. After three orbits, the pair manually landed their spacecraft in the Atlantic Ocean, thus performing the first controlled reentry. Unfortunately, they landed much farther from the landing zone than anticipated, about 97 km (60 miles) from the aircraft carrier U.S.S. Intrepid . But otherwise the mission was highly successful. Gemini III , America's first two-manned space mission, also was the first manned vehicle that was maneuverable. Grissom used the vehicle's maneuvering rockets to effect orbital and plane changes. Grissom wanted to name the spacecraft 'Molly Brown' (as in the Unsinkable, a Debbie Reynolds/Howard Keel screen musical). NASA was not amused and stopped allowing the astronauts to name their spacecraft (until forced to when having two spacecraft aloft at once during the Apollo missions). The flight by Young was the first of an astronaut outside of the original seven. Young, who created a media flap by taking a corned beef sandwich aboard as a prank, would go on to fly to the moon on Apollo and the Space Shuttle on its first flight sixteen years later. 1965 April 5 - . LV Family: Titan. Launch Vehicle: Titan II. Schirra and Stafford selected for Gemini-Titan 6. - . Nation: USA. Related Persons: Grissom, Schirra, Stafford, Young. Flight: Gemini 6. Spacecraft: Gemini. Manned Spacecraft Center announced that Walter M. Schirra, Jr., and Thomas P. Stafford had been selected as command pilot and pilot for Gemini-Titan 6, the first Gemini rendezvous and docking mission. Virgil I. Grissom and John W. Young would be the backup crew. 1965 December 15 - . 13:37 GMT - . Launch Site: Cape Canaveral. Launch Complex: Cape Canaveral LC19. LV Family: Titan. Launch Vehicle: Titan II GLV. Gemini 6 - . Call Sign: Gemini 6. Crew: Schirra, Stafford. Backup Crew: Grissom, Young. Payload: Gemini SC6. Mass: 3,546 kg (7,817 lb). Nation: USA. Agency: NASA Houston. Class: Manned. Type: Manned spacecraft. Flight: Gemini 6, Gemini 7. Spacecraft: Gemini. Duration: 1.08 days. Decay Date: 1965-12-16 . USAF Sat Cat: 1839 . COSPAR: 1965-104A. Apogee: 271 km (168 mi). Perigee: 258 km (160 mi). Inclination: 28.90 deg. Period: 89.60 min. The primary objective of the mission, crewed by command pilot Astronaut Walter M. Schirra, Jr., and pilot Astronaut Thomas P. Stafford, was to rendezvous with spacecraft No. 7. Among the secondary objectives were stationkeeping with spacecraft No. 7, evaluating spacecraft reentry guidance capability, testing the visibility of spacecraft No. 7 as a rendezvous target, and conducting three experiments. After the launch vehicle inserted the spacecraft into an 87 by 140 nautical mile orbit, the crew prepared for the maneuvers necessary to achieve rendezvous. Four maneuvers preceded the first radar contact between the two spacecraft. The first maneuver, a height adjustment, came an hour and a half after insertion, at first perigee; a phase adjustment at second apogee, a plane change, and another height adjustment at second perigee followed. The onboard radar was turned on 3 hours into the mission. The first radar lock-on indicated 246 miles between the two spacecraft. The coelliptic maneuver was performed at third apogee, 3 hours 47 minutes after launch. The terminal phase initiation maneuver was performed an hour and a half later. Two midcourse corrections preceded final braking maneuvers at 5 hours 50 minutes into the flight. Rendezvous was technically accomplished and stationkeeping began some 6 minutes later when the two spacecraft were about 120 feet apart and their relative motion had stopped. Stationkeeping maneuvers continued for three and a half orbits at distances from 1 to 300 feet. Spacecraft No. 6 then initiated a separation maneuver and withdrew to a range of about 30 miles. The only major malfunction in spacecraft No. 6 during the mission was the failure of the delayed-time telemetry tape recorder at 20 hours 55 minutes ground elapsed time, which resulted in the loss of all delayed-time telemetry data for the remainder of the mission, some 4 hours and 20 minutes. The flight ended with a nominal reentry and landing in the West Atlantic, just 10 km from the planned landing point, on December 16. The crew remained in the spacecraft, which was recovered an hour later by the prime recovery ship, the aircraft carrier Wasp. Gemini 6 was to have been the first flight involving docking with an Agena target/propulsion stage. However the Agena blew up on the way to orbit, and the spacecraft was replaced by Gemini 7 in the launch order. For lack of a target, NASA decided to have Gemini 6 rendezvous with Gemini 7. This would require a quick one week turnaround of the pad after launch, no problem with Russian equipment but a big accomplishment for the Americans. The first launch attempt was aborted; the Titan II ignited for a moment, then shut down and settled back down on its launch attachments. Schirra waited it out, did not pull the abort handles that would send the man catapulting out of the capsule on their notoriously unreliable ejection seats. The booster was safed; Schirra had saved the mission and the launch three days later went perfectly. The flight went on to achieve the first manned space rendezvous controlled entirely by the self-contained, on-board guidance, control, and navigation system. This system provided the crew of Gemini 6 with attitude, thrusting, and time information needed for them to control the spacecraft during the rendezvous. Under Schirra's typically precise command, the operation was so successful that the rendezvous was complete with fuel consumption only 5% above the planned value to reach 16 m separation from Gemini 7. 1966 July 21 - . Landing of Gemini 10 - . Return Crew: Collins, Young. Nation: USA. Related Persons: Collins, Young. Flight: Gemini 10. Spacecraft: Gemini. The retrofire maneuver was initiated at 70 hours 10 minutes after liftoff, during the 43rd revolution. The spacecraft landed at 21:06 GMT within sight of the prime recovery ship, the aircraft carrier Guadalcanal, some 5 km from the planned landing point on July 21. Apollo 207 (cancelled) - . Crew: McDivitt, Schweickart, Scott. Backup Crew: Cernan, Stafford, Young. Payload: CSM-101. Nation: USA. Program: Apollo. Flight: Apollo 207. Spacecraft: Apollo CSM. Before the Apollo 1 fire, it was planned that McDivitt's crew would conduct the Apollo D mission - a first manned test in earth orbit of the Lunar Module. Separate Saturn IB launches would put Apollo Block II CSM 101 / AS-207 and Lunar Module LM-2 / AS-208 into earth orbit. The crew would then rendezvous and dock with the lunar module and put it through its paces. After the fire, it was decided to launch the mission on a single Saturn V as Apollo 9. Apollo 13 - . Call Sign: Odyssey. Crew: Haise, Lovell, Swigert. Backup Crew: Duke, Mattingly, Young. Support Crew: Brand, Kerwin, Lousma. Payload: Apollo CSM 109 / Apollo LM 7 / ALSEP / S-IVB-508. Mass: 28,790 kg (63,470 lb). Nation: USA. Agency: NASA Houston. Program: Apollo. Class: Moon. Type: Manned lunar spacecraft. Flight: Apollo 13. Spacecraft: Apollo CSM. Duration: 5.95 days. Decay Date: 1970-04-17 . USAF Sat Cat: 4371 . COSPAR: 1970-029A. Apogee: 186 km (115 mi). Perigee: 184 km (114 mi). Inclination: 32.50 deg. Period: 88.31 min. 1972 April 16 - . 17:54 GMT - . Launch Site: Cape Canaveral. Launch Complex: Cape Canaveral LC39A. Launch Platform: LUT3. Launch Vehicle: Saturn V.
Apollo 16 - . Call Sign: Caspar. Crew: Duke, Mattingly, Young. Backup Crew: Haise, Mitchell, Roosa. Payload: Apollo CSM 113/LM 11/ ALSEP/ LRV-2/PFS 2/S-IVB-511. Mass: 30,358 kg (66,927 lb). Nation: USA. Agency: NASA Houston. Program: Apollo. Class: Moon. Type: Manned lunar spacecraft. Flight: Apollo 16. Spacecraft: Apollo CSM. Duration: 11.08 days. Decay Date: 1972-04-27 . USAF Sat Cat: 6000 . COSPAR: 1972-031A. Apogee: 169 km (105 mi). Perigee: 167 km (103 mi). Inclination: 32.54 deg. Period: 88.93 min. The Apollo 16 (AS-511) space vehicle was launched from Pad A, Launch Complex 39, KSC, at 12:54 p.m. EST April 16, with a crew of astronauts John W. Young, Thomas K. Mattingly II, and Charles M. Duke, Jr. After insertion into an earth parking orbit for spacecraft system checks, the spacecraft and the S-IVB stage were placed on a trajectory to the moon at 3:28 p.m. CSM transposition and docking with the LM were achieved, although a number of minor anomalies were noted. One anomaly, an auxiliary propulsion system leak on the S-IVB stage, produced an unpredictable thrust and prevented a final S-IVB targeting maneuver after separation from the CSM. Tracking of the S-IVB ended at 4:04 p.m. EST April 17, when the instrument unit's signal was lost. The stage hit the lunar surface at 4:02 p.m. April 19, 260 kilometers northeast of the target point. The impact was detected by the seismometers left on the moon by the Apollo 12 , 14 , and 15 missions. Spacecraft operations were near normal during the coast to the moon. Unexplained light-colored particles from the LM were investigated and identified as shredded thermal paint. Other activities during the translunar coast included a cislunar navigation exercise, ultraviolet photography of the earth and moon, an electrophoresis demonstration, and an investigation of the visual light-flash phenomenon noted on previous flights. Astronaut Duke counted 70 white, instantaneous light flashes that left no after-glow. Apollo 16 entered a lunar orbit of 314 by 107.7 kilometers at 3:22 p.m. April 19. After separation of LM-11 Orion from CSM 112 Casper , a CSM active rendezvous kept the two vehicles close together while an anomaly discovered on the service propulsion system was evaluated. Tests and analyses showed the redundant system to be still safe and usable if required. The vehicles were again separated and the mission continued on a revised timeline because of the 5 3/4-hour delay. The lunar module landed with Duke and Young in the moon's Descartes region, about 230 meters northwest of the planned target area at 9:23 p.m. EST April 20. A sleep period was scheduled before EVA. The first extravehicular activity began at 11:59 a.m. April 21, after the eight-hour rest period. Television coverage of surface activity was delayed until the lunar roving vehicle systems were activated, because the steerable antenna on the lunar module could not be used. 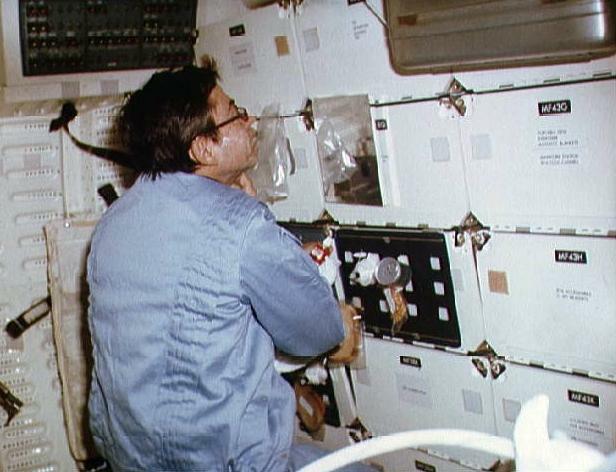 The lunar surface experiments packages were deployed, but accidental breaking of the electronics cable rendered the heat flow experiment inoperable. After completing activities at the experiments site, the crew drove the lunar roving vehicle west to Flag Crater, where they performed the planned tasks. The inbound traverse route was just slightly south of the outbound route, and the next stop was Spook Crater. The crew then returned via the experiment station to the lunar module and deployed the solar wind composition experiment. The duration of the extravehicular activity was 7 hours 11 minutes. The distance traveled by the lunar roving vehicle was 4.2 kilometers. The crew collected 20 kilograms of samples. The second extravehicular traverse, which began at 11:33 a.m. April 22, was south-southeast to a mare-sampling area near the Cinco Craters on Stone Mountain. The crew then drove in a northwesterly direction, making stops near Stubby and Wreck Craters. The last leg of the traverse was north to the experiments station and the lunar module. The second extravehicular activity lasted 7 hours 23 minutes. The distance traveled by the lunar roving vehicle was 11.1 kilometers. Four stations were deleted from the third extravehicular traverse, which began 30 minutes early at 10:27 a.m. April 23 to allow extra time. The first stop was North Ray Crater, where "House Rock" on the rim of the crater was sampled. The crew then drove southeast to "Shadow Rock." The return route to the LM retraced the outbound route. The third extravehicular activity lasted 5 hours 40 minutes, and the lunar roving vehicle traveled 11.4 kilometers. Lunar surface activities outside the LM totaled 20 hours 15 minutes for the mission. The total distance traveled in the lunar roving vehicle was 26.7 kilometers. The crew remained on the lunar surface 71 hours 14 minutes and collected 96.6 kilograms of lunar samples. While the lunar module crew was on the surface, Mattingly, orbiting the moon in the CSM, was obtaining photographs, measuring physical properties of the moon and deep space, and making visual observations. Essentially the same complement of instruments was used to gather data as was used on the Apollo 15 mission, but different areas of the lunar surface were flown over and more comprehensive deep space measurements were made, providing scientific data that could be used to validate findings from Apollo 15 as well as add to the total store of knowledge of the moon and its atmosphere, the solar system, and galactic space. The LM lifted off from the moon at 8:26 p.m. EST April 23, rendezvoused with the CSM, and docked with it in orbit. 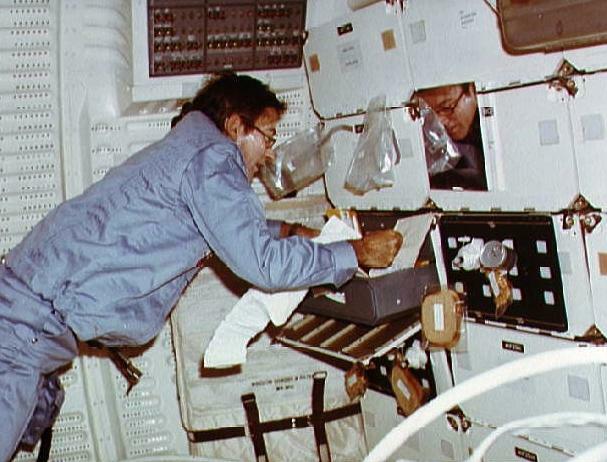 Young and Duke transferred to the CSM with samples, film, and equipment, and the LM was jettisoned the next day. LM attitude control was lost at jettison; therefore a deorbit maneuver was not possible and the LM remained in lunar orbit, with an estimated orbital lifetime of about one year. The particles and fields subsatellite was launched into lunar orbit and normal system operation was noted. However, the spacecraft orbital shaping maneuver was not performed before ejection and the subsatellite was placed in a non-optimum orbit that resulted in a much shorter lifetime than the planned year. Loss of all subsatellite tracking and telemetry data on the 425th revolution (May 29) indicated that the subsatellite had hit the lunar surface. The mass spectrometer deployment boom stalled during a retract cycle and was jettisoned before transearth injection. The second plane-change maneuver and some orbital science photography were deleted so that transearth injection could be performed about 24 hours earlier than originally planned. Activities during the transearth coast phase of the mission included photography for a contamination study for the Skylab program and completion of the visual light-flash-phenomenon investigation that had been partially accomplished during translunar coast. A 1-hour 24-minute transearth extravehicular activity was conducted by command module pilot Mattingly to retrieve the film cassettes from the scientific instrument module cameras, inspect the equipment, and expose a microbial-response experiment to the space environment. Two midcourse corrections were made on the return flight to achieve the desired entry interface conditions. 1972 April 21 - . 16:47 GMT - . EVA Apollo 16-1 - . Crew: Duke, Young. EVA Duration: 0.30 days. Nation: USA. Related Persons: Duke, Young. Program: Apollo. Class: Moon. Type: Manned lunar lander. Flight: Apollo 16. Spacecraft: Apollo LM. Explored lunar surface near LM and deployed ALSEP unmanned scientific station equipment..
1972 April 22 - . 16:33 GMT - . EVA Apollo 16-2 - . Crew: Duke, Young. EVA Duration: 0.31 days. Nation: USA. Related Persons: Duke, Young. Program: Apollo. Class: Moon. Type: Manned lunar lander. Flight: Apollo 16. Spacecraft: Apollo LRV. Drove in lunar rover to Stone Mountain..
1972 April 23 - . EVA Apollo 16-4 - . Crew: Duke, Young. EVA Duration: 0.0014 days. Nation: USA. Related Persons: Duke, Young. Program: Apollo. Class: Moon. Type: Manned lunar lander. Flight: Apollo 16. Spacecraft: Apollo LM. Internal Vehicular Activity. Threw excess equipment out of LM before lift-off..
1972 April 23 - . 15:25 GMT - . EVA Apollo 16-3 - . Crew: Duke, Young. EVA Duration: 0.24 days. Nation: USA. Related Persons: Duke, Young. Program: Apollo. Class: Moon. Type: Manned lunar lander. Flight: Apollo 16. Spacecraft: Apollo LRV. Drove in lunar rover to North Ray crater..
1972 April 27 - . Landing of Apollo 16 - . Return Crew: Duke, Mattingly, Young. Nation: USA. Related Persons: Duke, Mattingly, Young. Program: Apollo. Flight: Apollo 16. Entry and landing were normal, completing a 265-hour 51-minute mission. The command module was viewed on television while dropping on the drogue parachutes, and continuous coverage was provided through crew recovery. Splashdown was at 2:45 p.m. EST (19:45 GMT) in mid-Pacific, 5 kilometers from the recovery ship U.S.S. Ticonderoga . All primary mission objectives had been achieved. 1972 December 7 - . 05:33 GMT - . Launch Site: Cape Canaveral. Launch Complex: Cape Canaveral LC39A. Launch Platform: LUT3. Launch Vehicle: Saturn V.
Apollo 17 - . Call Sign: America. Crew: Cernan, Evans, Schmitt. Backup Crew: Duke, Roosa, Young. Payload: Apollo CSM 114/LM 12/ ALSEP/ LRV-3/S-IVB-512. Mass: 30,342 kg (66,892 lb). Nation: USA. Agency: NASA Houston. Program: Apollo. Class: Moon. Type: Manned lunar spacecraft. Flight: Apollo 17. Spacecraft: Apollo CSM. Duration: 12.58 days. Decay Date: 1972-12-19 . USAF Sat Cat: 6300 . COSPAR: 1972-096A. Apogee: 167 km (103 mi). Perigee: 167 km (103 mi). Inclination: 28.53 deg. Period: 87.83 min. Apollo 17 (AS-512), the final Apollo manned lunar landing mission, was launched from Pad A, Launch Complex 39, KSC, at 12:33 a.m. EST December 7. Crew members were astronauts Eugene A. Cernan, Ronald E. Evans, and Harrison H. Schmitt. The launch had been delayed 2 hours 40 minutes by a countdown sequencer failure, the only such delay in the Apollo program caused by a hardware failure. All launch vehicle systems performed normally in achieving an earth parking orbit of 170 by 168 kilometers. After checkout, insertion into a lunar trajectory was begun at 3:46 a.m.; translunar coast time was shortened to compensate for the launch delay. CSM 114 transposition, docking with LM-12, and LM ejection from the launch vehicle stage were normal. The S-IVB stage was maneuvered for lunar impact, striking the surface about 13.5 kilometers from the preplanned point at 3:27 p.m. EST December 10. The impact was recorded by the passive seismometers left on the moon by Apollo 12 , 14 , 15 , and 16 . The crew performed a heat flow and convection demonstration and an Apollo light-flash experiment during the translunar coast. The scientific instrument module door on the SM was jettisoned at 10:17 a.m. EST December 10. The lunar orbit insertion maneuver was begun at 2:47 p.m. and the Apollo 17 spacecraft entered a lunar orbit of 315 by 97 kilometers. After separation of the LM Challenger from the CSM America and a readjustment of orbits, the LM began its powered descent and landed on the lunar surface in the Taurus-Littrow region at 2:55 p.m. EST on December 11, with Cernan and Schmitt. The first EVA began about 4 hours later (6:55 p.m.). Offloading of the lunar roving vehicle and equipment proceeded as scheduled. The Apollo Lunar Surface Experiment Package was deployed approximately 185 meters west northwest of the Challenger . Astronaut Cernan drove the lunar roving vehicle to the experiments deployment site, drilled the heat flow and deep core holes, and emplaced the neutron probe experiment. Two geological units were sampled, two explosive packages deployed, and seven traverse gravimeter measurements were taken. During the 7-hour 12-minute EVA, 14 kilograms of samples were collected. The second extravehicular activity began at 6:28 p.m. EST December 12. Because of geological interest, station stop times were modified. Orange soil was discovered and became the subject of considerable geological discussion. Five surface samples and a double core sample were taken in the area of the orange soil. Three explosive packages were deployed, seven traverse gravimeter measurements were taken, and observations were photographed. Samples collected totaled 34 kilograms during the 7 hours and 37 minutes of the second EVA. The third and final EVA began at 5:26 p.m. EST December 13. Specific sampling objectives were accomplished. Samples - including blue-gray breccias, fine-grained vesicular basalts, crushed anorthositic rocks, and soils - weighed 66 kilograms. Nine traverse gravimeter measurements were made. The surface electrical properties experiment was terminated. Before reentering the LM, the crew selected a breccia rock to dedicate to the nations represented by students visiting the Mission Control Center. A plaque on the landing gear of the lunar module, commemorating all of the Apollo lunar landings, was then unveiled. After 7 hours 15 minutes, the last Apollo EVA on the lunar surface ended. Total time of the three EVAs was approximately 22 hours; the lunar roving vehicle was driven 35 kilometers, and about 115 kilograms of lunar sample material was acquired. While Cernan and Schmitt were exploring the lunar surface, Evans was conducting numerous scientific activities in the CSM in lunar orbit. In addition to the panoramic camera, the mapping camera, and the laser altimeter, three new scientific instrument module experiments were included in the Apollo 17 orbital science equipment. An ultraviolet spectrometer measured lunar atmospheric density and composition; an infrared radiometer mapped the thermal characteristics of the moon; and a lunar sounder acquired data on the subsurface structure. Challenger lifted off the moon at 5:55 p.m. EST December 14. Rendezvous with the orbiting CSM and docking were normal. The two astronauts transferred to the CM with samples and equipment and the LM ascent stage was jettisoned at 1:31 a.m. December 15. Its impact on the lunar surface about 1.6 kilometers from the planned target was recorded by four Apollo 17 geophones and the Apollo 12 , 14 , 15 , and 16 seismometers emplaced on the surface. The seismic experiment explosive packages that had been deployed on the moon were detonated as planned and recorded on the geophones. During the coast back to earth, Evans left the CSM at 3:27 p.m. EST December 17 for a 1-hour 7-minute inflight EVA and retrieved lunar sounder film and panoramic and mapping camera cassettes from the scientific instrument module bay. The crew conducted the Apollo light- flash experiment and operated the infrared radiometer and ultraviolet spectrometer. Reentry, landing, and recovery were normal. The command module parachuted into the mid-Pacific at 2:25 p.m. EST December 19, 6.4 kilometers from the prime recovery ship, U.S.S. Ticonderoga . The crew was picked up by helicopter and was on board the U.S.S. Ticonderoga 52 minutes after the CM landed. All primary mission objectives had been achieved. 1981 April 14 - . Landing of STS-1 - . Return Crew: Crippen, Young. Nation: USA. Related Persons: Crippen, Young. Program: STS. Flight: STS-1. STS-1 landed at 18:20 GMT. .
2018 January 5 - . Death of John Watts Young. - . Related Persons: Young.